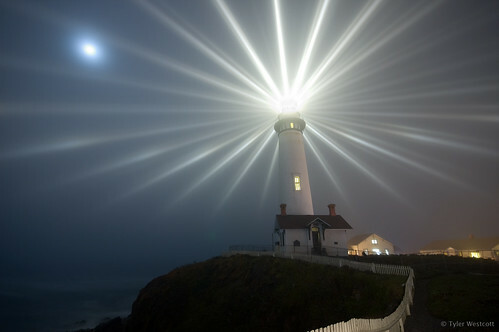 Once per year at the Pigeon Point Lighthouse they shut down the weak insipid modern aerobeacon light and switch over to the 1kilowatt lamp (which replaced the older oil-burning lamps) and fresnel lens of the original, restoring its appearance to what it was 135 years ago. Last night was the night, and it's really quite a sight. When they fire it up there's really a collective sense of "whoa!" from the audience (which was WAY bigger than I expected - I probably had to park a mile away and I was there an hour early). Capturing a shot like this is tricky because the lens itself actually rotates, which looks great but is tough for long exposures. But for the first 5 minutes they leave it static to indulge all of the photographers who turn out and want this shot (this highly unique and one-of-a-kind shot of course). When they switched to this light my camera still had about a minute of noise reduction to do on my final test shot to get the exposure right, so I missed the first minute. Then I started this shot which was about 2 minutes long, followed by 2 minutes of noise reduction again. So by the time I had my shot it was too late for a do-over. So this is it, I only got to take one photo and this is what I got, so I hope it worked out. It's also noteworthy that the fog last night was insane, even for a San Francisco local. On the drive home there were times when I couldn't see the road in front of me, only the orange reflectors in the middle of the road (for about 60ft). It worked out beautifully for viewing the lighthouse, though I also found that if I backed away much further than this I'd lose sight of the lighthouse itself. The unfortunate consequence of all the fog was that it was almost impossible to keep the lens and camera dry, so the lesson learned was to always keep towels with you when shooting the California coast. And in case you're wondering, that is the moon in the upper left. Follow me on Facebook | Visit my Website. - Does the moon work in the shot? Not as well as I'd hoped, but I could hardly move it aside either. To cut it out of the frame would have been a worse compromise in my opinion. - Is it crooked? No - it's level. But I shot with a wide angle lens pointed upwards to capture the rays as much as possible which creates a keystoning problem that throws off the angles. I could fix this, but haven't. - Why do noise reduction in-camera? This is different from the noise reduction you can do in post-production, and it eliminates hot pixels and blooming from the amps that are typical in digital long exposures (and are very tough to remove in post, if at all possible without specialized software). -HDR? Not that I think HDR would have even helped here, but I'm not usually a fan of it anyways. And I have never even figured out how to do it myself. So no. -Unique & One of a kind? Yeah, it's both redundant AND inaccurate. I was being lighthearted - man, a lot of people just hate that I said that. Thanks for taking the time to look and for all the great comments! Looks like this found its way onto Digg / Digital Photography School - cool! Thanks for checking it out!